Labour have released their manifesto for the Greenwich Borough local elections being held on 3rd May. This follows on from last week’s post looking at the previous 2014 manifesto and just how promises made then have panned out. In many ways the manifesto is very similar to the previous one. Many of the same buzzwords, which as we’ve have seen, often didn’t transfer into action or even a move towards altering or challenging long-standing issues. I was intending for this to be one post but its run on a bit so it’ll be broken down into two parts, for everyone’s sanity. Other parties will get the same coverage and analysis but given Labour got theirs out first we’ll start here. Firstly, it’s a slick old document. Big bold colours. All very pretty (and unlike many Greenwich streets). As we’ll see, it does begin to resemble style over substance the further along we read. So then, kicking off with the forward by council leader Denise Hyland (Labour – Abbey Wood ward). By paragraph two of her introduction the ding-ding-dings are already going off. Transport achievements listed are things way in the past and not issues now. DLR to Woolwich? Great and all but that’s over a decade old since approval. Also, some very selective points are made such as Greenwich having “been one of the highest performing London Councils in providing new affordable homes”. Well, we know “affordable” is a very broad term and in many cases simply isn’t affordable for many in London. What about social homes – formally known as council housing? The GMB union looked into each London borough and Greenwich didn’t look so good. Just 8.3% of new homes in 2016/17 were social housing in Greenwich Borough, which is the seventh lowest out of 33 London authorities. That’s despite Greenwich having the fifth highest amount of new housing in 2016/17 out of 33 authorities, with 1,560 homes built. And remember, this is research from a trade union. Paragraph three (don’t worry I won’t go through them all. EDIT: I actually did… sorry) says: “We want to help people, residents, to get on in life, share in our prosperity”. That doesn’t exactly tally with low levels of social housing from large amounts of new developments. And certainly doesn’t explain why so much income from new developments through Section 106 payments is sitting in council accounts and not improving various areas of the borough. 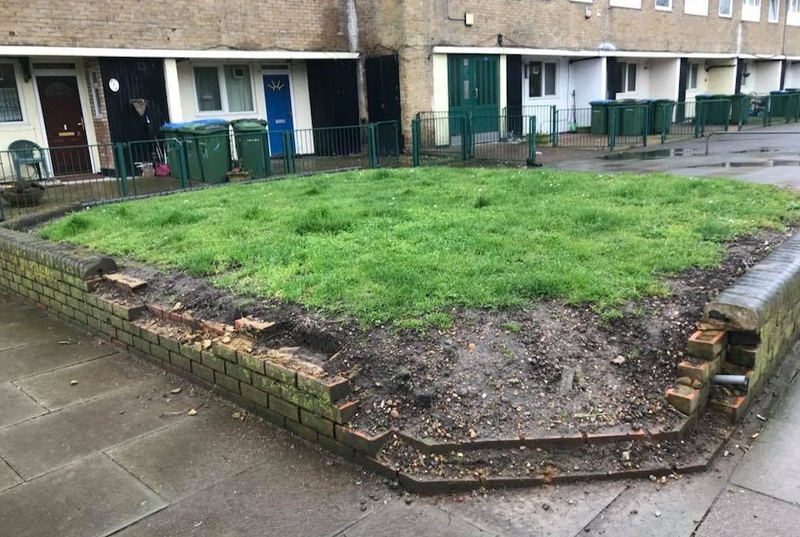 It doesn’t explain, to give just one example, why £55,000 received from a Plumstead housing development was taken and spent in central Greenwich despite being listed for “local improvements”, nor why so much TfL money given to the council is unspent. There’s then a fair bit about central government but which isn’t really under the remit of a local authority. Fair enough for a General Election campaign. Not really a local. Some more amusing words follow about public transport and the environment. Anyone who knows the area or reads this site and others like 853 knows the lamentable record on the environment. Supporting Silvertown Tunnel, the cruise liner terminal with no cleaner on-shore power, failing to make streets better for pedestrians, approving numerous large car-friendly retail sheds – it goes on and on. Silence on Southeastern’s recent consultation and other issues is also pretty common. This week it was revealed that the forthcoming May 2018 timetable sees two less trains an hour through Greenwich in the evenings than proposed under the 2017 consultation. I’ve heard nothing from Greenwich Council or Councillors raising this, which follows a very common pattern. We are determined to build homes for local people and offer genuinely affordable social rents. Determination doesn’t seem to meet actual action. If there was determination to build they would have used Meridian Home Start to a greater extent and not purchased over 100 market homes at £65 million – pushing up prices for others struggling to buy. It’s a policy which does nothing to increase overall housing numbers. As for social rents – look at that GMB research again. Blimey, that was just the foreword. This is the first part covered. Not my area of expertise admittedly. There’s lots of “campaign” and “lobby” mentioned regarding A&E and other matters yet council powers are limited. Here’s one way WITHIN their power to improve health. Get more people walking. How? 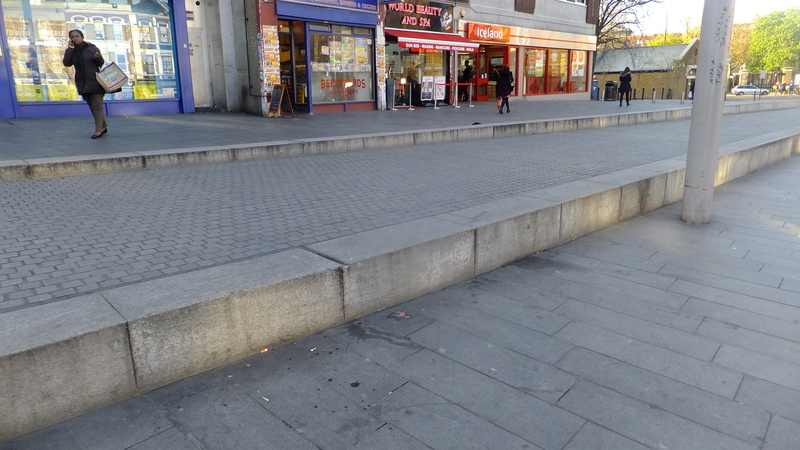 Improve some dire public realm. And there is nothing whatsoever under a section called “A Healthy Community” on doing that. Until Councillors challenge departments instead of buying excuses for poor practices don’t expect change. Again, few direct powers here for councils. On issues where the local authority does have power what’s listed is often mere tinkering. Play Streets are mentioned and a good thing, but closing the odd road for one Sunday a month is going to do next to nothing to entice people to get out on foot the rest of the time. They claim they will increase enforcement action against anti-social behaviour. Currently it’s one of the lowest across London. Littering fines actually plummeted in 2016/17 and during the start of 2017/18 which are the last available figures. There’s no commitment to regulate all landlords in the worst 20% of wards with known problems despite councils having the power to do so alongside regulating Homes of Multiple Occupation. Even some Tory boroughs will be stricter than Labour Greenwich on standards for private renters unless that changes. Not only does widespread regulation and licensing drive up standards but brings in vastly more council tax as currently there’s mass avoidance. Newham has recovered more than £3.1 million in council tax since the introduction of its licensing scheme. Since April 2017, council’s can also fine landlords up to £30,000 for poor conditions yet the manifesto only mentions prosecution. That doesn’t make sense anymore in many cases since the change as 1) it costs the council more money and 2) they usually receive less income from prosecutions. Some Landlords see prosecution as an occupational hazard as the fines are pitiful. Using new powers would hurt the worst slumlords to a greater extent. As I’m reading through the manifesto I’m scanning to see firm commitments on any issue that lie within their power and aren’t general matters where power lies elsewhere, or being aware of recent changes in legislation and action in other authorities. Come on, show something here to improve things. Well, they can already do this and have failed pretty badly. Though it’s far from easy for councils they don’t make it easy for themselves. And there’s no differentiation between “affordable” and social here. Greenwich’s Deputy Leader Dan Thorpe has previously appeared to use the term interchangably despite the big difference in cost. And the words consult and Greenwich aren’t great bedfellows. I’m working on another article which shows crucial consultation on development that should have happened 18 months ago hasn’t occurred. OK – social rent is mentioned here. Good. But so very vague. How many homes? What type? More bungalows by Zone 2 stations as seen in Lewisham or decent density to help residents desperate for secure and affordable housing? Meridian gets a mention which is good given it’s the only way to provide truly affordable homes at volume, yet so, so vague here again. Where’s the ambition? Numbers built are pitiful compared to some other Labour councils. Can we expect a very low trickle again as seen since 2014? This will not even begin to solve the housing crises or assist those in expensive private rentals on the continual merry-go-round of moving every year. This is very welcome. Though with Meridian the scope is there to better this, but at least a firm commitment is in place. More social homes saves taxpayers as residents – especially the homeless -aren’t being housed in very expensive private rentals, B&Bs and hotels. Well they have to by law now, but no commitment on increasing much will be spent locally is evident. Greenwich Council are pursuing just 15% retained and spent in local areas – the lowest possible by law. And CIL is half the story. What about Section 106? Huge sums still unspent and incoming in coming years. Consulting on that? When it comes to the Council as a Landlord they only mention buildings and NOT public areas around them, which are often in a dire state. The Housing Department doesn’t seem to know it is responsible for many public spaces and not just buildings. Nor does this manifesto. I’ll wrap it up for now as quite a bit of the manifesto is left to cover. A part two will follow. As will a look at the Tory manifesto for Greenwich. I recently had someone comment that I was going too hard on Greenwich Labour. Well, they do run the borough and have done for more than four decades. Rest assured, in the unlikely event of a Tory landslide (again, don’t laugh) they’ll get the same scrutiny. And anyway, at last year’s General Election this site criticised some Tory candidates. And recently has highlighted some of the nonsense coming out of Tory Bexley Council, as ably covered regularly by Bexley is Bonkers. This manifesto is a work of fiction much like railway timetables. I am shocked to read that Labour spent £65 million pounds on so few properties. I can’t help but wonder if the bathrooms had marble sanitryware and gold taps. Look forward to part 2 and your analysis of the other parties’ manifesto. Good job breaking down and analysing the things they put in there. The figures for fines related to litter really show off the reality. How can the numbers halve (or worse). At a time they plead poverty. It is similar with housing. They can state this and that, and put in words like “hope” and “promise” but the reality is different when actual figures are shown. When compared to most Labour council’s they’re letting residents down badly, and housing is one massive area they need to up their game. Thing is what will wake them up out of complacency? Most are wealthy and don’t have a clue what it’s like to live in council estates or the north of borough. Thank you for this. My impression on reading the manifesto was long on piety, short on specific pledges, and your detailed analysis confirms this. It’s true that Labour will undoubtedly win again and indeed they have some good things to their credit. But given that the Tories’ manifesto (which I know you will adresss later) is deeply uninspiring, and the lack of a manifesto from other small parties, it seems to me that we need to know which prospective Councillors are prepared to challenge the status quo especially on issues such as the Silvertown tunnel, the cruise ship terminal and the appalling air quality, not to mention the other matters which you have highlighted such as housing and the state of the public realm,. That way we might see a Council which is less sclerotic and much more responsive to the electorate. We all know labour will walk it and the manifesto will become nothing but a fictional matter. They even know themselves that they are in before the voters have voted – expect nothing to happen in terms of progress. Sigh. I would no more vote Tory than Labour, but I don’t think the party has no chance of overturning Labour’s 42 seat majority. There are only nine Conservative councillors in Greenwich. Labour will be returned to power and continue to do nothing much to make the lives of the borough’s residents better.